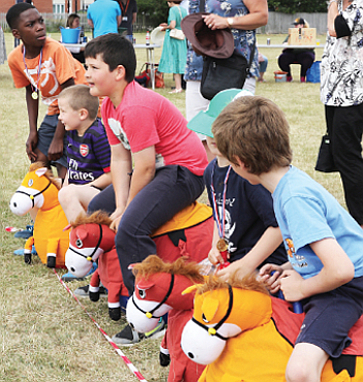 BACK by popular demand and blessed with beautiful weather, a community day in Woking more than lived up to expectations for free fun, food and frolics on Saturday – with an added surprise that hadn’t been factored in. The sunshine and packed programme, organised by the South Woking Churches, drew crowds of about 500 to the second annual South Woking Community Fun Day. 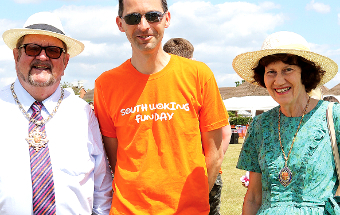 Although the borough’s busy Mayor, Derek McCrum, had a hectic schedule on Saturday, he made time to support the community event at St Peter’s Rec in Old Woking. And a young man called Nick decided it was the perfect time and venue to publicly propose marriage to his girlfriend, Georgina. He got down on one knee and did just that – and she said ‘yes’. 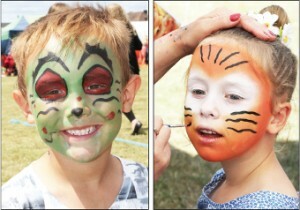 The event featured a host of activities, competitions and musical performances as well as a free barbeque. 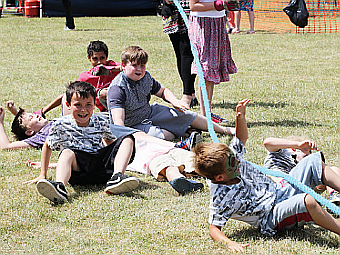 Other activities included street golf, a crockery smashing stall, face-painting, several inflatables, a sponge toss and much more. Meanwhile, competitions featured a space hopper race, egg and spoon race and various categories for the ever-popular tugs of war. 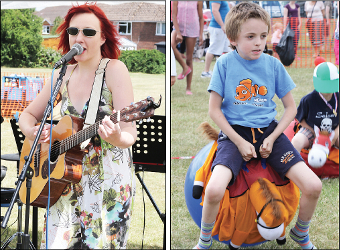 Musical accompaniment was provided by talented local performers and community groups including singer songwriter Anna Neale, Jam & Cake, and The Old Woking Show Choir, as well as schoolgirl singer Amber Richmond. While many took part in activities, others were delighted to relax in the shade of the Tea Tent and soak up the atmosphere, listening to the excellent entertainment. Event Organiser Andrew Bates said: “It was wonderful to see the event happen again and to see people coming together and enjoying themselves. It was an excellent team effort from the local churches.